Rampage forward Craig Munro circles the Terrace net during Saturday night's 6-3 loss to the River Kings at Frank Pyde Memorial Arena. Despite a third period comeback, the Rupert Rampage lost its first game of the season 6-3 to the Terrace River Kings in Prince Rupert. 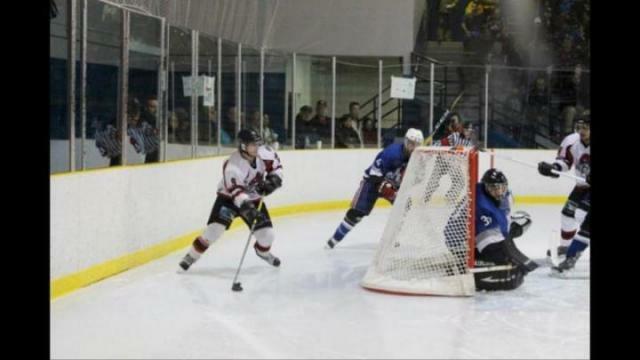 Despite a third period comeback, the Rupert Rampage lost its first game of the season last Saturday night, 6-3 to the Terrace River Kings at Frank Pyde Memorial Arena. The two rivals took things to another level, racking up 25 penalties and 110 penalty minutes in a rough game that left players and coaches frustrated after the final buzzer sounded. “I thought the refereeing tonight was awful. It was horrendous, especially towards the end,” said Rampage general manager and CIHL president Ron German, who specified it was awful for both teams. As the game reached its climax in the last couple of minutes, things intensified and referees handed out seven penalties in the final 50 seconds alone. Despite that, it’s not the only reason the Rampage lost. There wasn’t a lot that went right for the team. “I’m not going to say we did much well. We were struggling in a lot of different things today,” German said. These two teams have now played each other three times in the past four games and it shows as the intensity of each game only increased. But German loves the rivalry. “It’s going to be a pretty exciting season, the battle between Rupert and Terrace all year. The rivalry is going to be huge,” he said. The Rampage are now 2-1 and sit behind only Williams Lake (3-0) in the standings, but it’s a long season. “I want them to work hard and bounce back. We’ve got a great crew this year and I just want to see us keep working hard and not implode and start taking stupid penalties,” said German. The Rampage (11) did take less penalties than Terrace (14) in the game, which hasn’t been the norm, but the Rupert team is far and away from the rest of the league in penalty minutes. The Rampage have 116, while the River Kings are second with only 87. It’s not a new problem this year, but it’s something German repeatedly states he wants the team to improve on. The rhinos struck first on a goal by Craig Munro in the first few minutes to the delight of a crowd of more than 750 people. Just past the halfway mark of the period, River Kings rookie Robert Orrey tied it up on a breakaway. Rupert goalie Devin Gerrits made the initial save, but Orrey put in the rebound for his first CIHL goal. But the close game was broken open in the second. Ben Reinbolt and Brett Downie scored less than two minutes apart early in the period to give Terrace a 3-1 lead. That shifted the momentum for the River Kings for much of the frame, as they dominated puck possession and were constantly challenging Gerrits, who made 24 saves on 29 shots in the game. The Rampage thought they scored halfway through the period, but it was waved off, much to the dismay of a booing crowd. German said the team was all pretty positive the puck was in, but there was nothing they could do about it. The game was highly physical from start to finish, with several players slow to get up at different times. In the third period, Rupert captain Jared Meers was checked and was slow to get back up and the River Kings scored on the same play. Kory Movold responded to the hit and ensuing goal by fighting Luke Gordon. Both players were ejected from the game and the referees spent a few minutes before confirming that the goal counted. Now down 4-1, the Rampage kicked up the pressure. It finally paid off on a goal by Josh Cook, who fired one in the top right corner past Terrace goalie Darren Beaulieau, who made 33 saves. Five minutes later, while on the powerplay, Jacob Santurbano hammered a slapshot into the net to bring the Rampage within one goal. The “Let’s Go Rampage” chants from the crowd were cut short when the River Kings scored with less than two minutes to play to take a 5-3 lead. Terrace also added an empty-net goal. There were quite a few skirmishes and fights in the final minute that led to several players being thrown out. Jean-Luc Fournier and Luke Walker were given the boot for fighting, and several other players were also handed penalties. The Rampage have the weekend off and will play the Steelheads in Smithers on Oct. 29.